The title, Two Special Attack Corps members, does not fully describe the book's contents. The two Special Attack Corps members referred to in the title are Flight Petty Officers 1st Class Sei Miyagawa (right-side photo on cover ) and Satoshi Nonami (left-side photo on cover), who both died during the first five days of suicide attacks by the Kamikaze Corps  in the Philippines. They coincidentally were classmates at Nakamura Middle School in Ogata Town (now part of Kuroshio Town) in Kōchi Prefecture. Although portions of the book's first half mention the personal histories of these two Zero pilots, most of the book covers either general history of the Japanese military's suicide attacks or specific topics related to Kōchi Prefecture. Masasuke Ōnishi's interest in the subject does not get disclosed until the Afterword, where he writes that he graduated from the same school as Miyagawa and Nonami, although nearly three decades later. Ōnishi clearly has fervid opinions about Japanese history as he several times refers to special attacks as an inhumane battle tactic and to the militaristic government right before and during the Pacific War as fascist. These strong views most likely are consistent with his position as Communist Party Committee Head for the Hata Area of Kōchi Prefecture. The book's scope never gets clearly defined. The amount of specific material about the title's two Special Attack Corps members probably totals only enough for a long magazine article. The book introduces six students from Nakamura Middle School, including Miyagawa and Nonami, who all entered the 10th Kō Class of the Japanese Navy Yokaren (Preparatory Flight Training Program) in April 1942 at Tsuchiura Air Base. The other four men died before Miyagawa and Nonami in late October 1944 carried out their suicide attacks, each flying a Zero fighter that carried a 250-kg bomb. One former Nakamura Middle School classmate, Matsudo, survived the Battle of the Philippine Sea (nicknamed "Marianas Turkey Shoot") in June 1944 but died the following month in an accident during torpedo bomber practice. Two other classmates, Sasamoto and Yanogawa, died in air battles in the Philippines during September 1944. Another classmate, Tabe, died in battle after flying from Tainan Air Base in Taiwan on October 12, 1944. The deaths of all six classmates illustrate the decimation suffered by Japanese Navy aviators. The author also covers the names and circumstances surrounding the deaths of 38 other Navy and 12 Army airmen from Kōchi Prefecture who died in special attacks. In addition, the story of a third Kamikaze Corps airman from Nakamura Middle School gets introduced. He died in a suicide attack using a Shiragiku trainer when he took off from Kushira Air Base in Kagoshima Prefecture on June 21, 1945. Only the first four chapters cover the personal histories of Miyagawa and Nonami, but even their stories get obscured by the large amount of background and related information concerning the Japanese Navy, World War II, Yokaren training program, special attacks, and other four airmen from Nakamura Middle School who were in the same Yokaren class. The book's last four chapters introduce topics such as how special attacks arose as a battle strategy, how people remember those who died in special attacks, and what roles Kōchi Prefecture played in the history of special attacks. The chapters do not follow a chronological order, so certain time periods get covered in more than one place. Flight Petty Officer 1st Class Sei Miyagawa volunteered at Mabalacat Air Base to become a member of the first kamikaze unit organized by Vice Admiral Takijiro Ōnishi during the late evening of October 19, 1944. Miyagawa was assigned first to the Yamato Squadron, but on October 22 he was reassigned to the Kikusui (Chrysanthemum) Squadron. His squadron moved on October 24 to Davao No. 2 Air Base, from where he carried out his suicide mission on October 25, 1944, the same date that Lieutenant Yukio Seki led the first official Kamikaze Special Attack Corps attack from Mabalacat . Flight Petty Officer 1st Class Satoshi Nonami was named as Hatsuzakura Squadron leader on October 26, 1944. On the following day, there was an official ceremony at Nichols Air Base to recognize officially the formation of the Hatsuzakura Squadron. The ceremony was attended by Vice Admiral Takijiro Ohnishi and Vice Admiral Shigeru Fukudome. 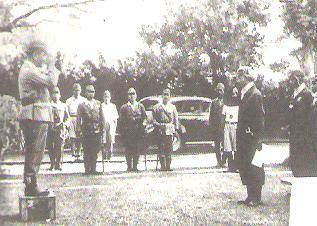 The photograph below shows Fukudome (left) and Nonami (right) saluting each other after Fukudome had handed Nonami written orders regarding his Kamikaze Corps squadron. On October 29, 1944, Nonami and his squadron took off from Nichols No. 2 Air Base on their suicide mission and did not return. It is getting to be more and more like autumn. I imagine that our town's persimmons have become ripe and are radiant in the evening sun. Is everyone including my younger brothers and sisters doing well? I have become a full-fledged naval airman. My ardent desire from when I was a student has been achieved with this. In a few days, for our country Japan, I will cross over the boundary between life and death and carry out the destruction of America and Britain. I will soon no longer be of the Nonami Family as I dedicate myself to our country. I am filled with joy to be able to courageously die in battle as a shield for the country. Father, Mother, how are you? I ask that you take care of everything in my absence. Ōnishi relies quite heavily on other books (e.g., Shikishima tai no gonin (Five men of Shikishima Squadron) by Shirō Mori, Kōchi kaigun kōkūtai: Shiragiku tokubetsu kōgekitai (Kōchi Naval Air Group: Shiragiku special attack unit) by Yūdai Mikuni), and his own book includes extensive quoted material from many of these sources. The ten-page bibliography shows the extent of his research, but he seems to have felt compelled to mention in his book anything related to special attacks if there was any connection at all to Kōchi Prefecture even though some topics have only a distant relationship to the stories of Miyagawa and Nonami. 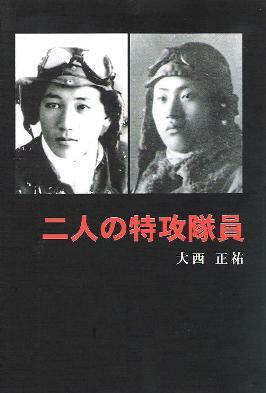 Besides the photos of the two pilots on the cover, the book contains only two other photos, one of Nonami taken at Nichols Air Base (see above) and another taken in July 1942 of Miyagawa, Nonami, and two other Nakamura Middle School classmates in Navy uniforms after they had entered the Yokaren. An appendix includes a 22-page chronology of important events from 1924 to 1945 in (1) the world and Japan and (2) Kōchi Prefecture with an emphasis on Hata-gun. The chronology illustrates the author's tendency to add materials to the book even though they have almost no relevance to the book's main theme. Chapter 5 presents four aspects of Japan's Special Attack Corps directly related to Kōchi Prefecture. First, the Shiragiku Unit of the Special Attack Corps was formed at Kōchi Naval Air Base in March 1945. Five squadrons totaling 52 men lost their lives in nighttime special attacks with slow Shiragiku trainers from Kanoya Air Base in Kagoshima Prefecture from May 24 to June 25, 1945. Second, during 1945 the Navy built several shoreline bases in Kōchi Prefecture in preparation for an anticipated American invasion of the Japanese mainland. These bases had the following special attack weapons to be used in suicide attacks against American ships if they tried to invade the mainland: shinyō explosive motorboats, kaiten human torpedoes, and kairyu and koryu midget submarines. Third, one day after the Emperor's announcement of surrender on August 15, 1945, explosions killed 111 men at the Navy's shinyō boat base in Yasu Town. The explosions took place as shinyō motorboats were being prepared for launch, but it remains somewhat unclear as to who exactly gave the orders for the boats to be prepared for launch and why such an order was given . Fourth, Motoharu Okamura, who lived in Kōchi Prefecture, committed suicide in July 1948 supposedly for his responsibility in sending so many young men to their deaths as commander of the 721st Air Group (Jinrai Butai or Divine Thunder Unit). This unit carried out attacks with ōka rocket-powered manned missiles from March to June 1945 in which many young ōka pilots and crewmembers of the Betty bombers that carried the ōka weapons lost their lives. Chapter 6 summarizes the entire ten-month history of aerial special attacks, although much of it is covered earlier, with mention of each of the 50 men from Kōchi Prefecture other than Miyagawa and Nonami who died in special attacks. Chapter 7 discusses in detail the historical background that led the Japanese military to institute special attacks. The background goes all the way back to the Manchurian Incident in 1931. Chapter 8 presents the three main ways Japanese people remember those young men who died in special attacks: (1) fallen war heroes, (2) foundation for Japan's postwar prosperity, and (3) wasteful sacrifice of lives in that they died a dog's death (inuji in Japanese). 1. The author never identifies the two pilots shown on the cover and title page. The identification on this web page is based on an examination of a photograph on page 36 that was taken in July 1942 of a group that included Sei Miyagawa and Satoshi Nonami. 2. The Kamikaze Corps was actually named the Shinpu Corps by Vice Admiral Takijiro Ōnishi. The names Kamikaze and Shinpū are two different ways to pronounce the same two kanji (Chinese characters). Masasuke Ōnishi explains that even an announcer of Japan News on November 9, 1944, pronounced the name of the newly formed Special Attack Corps as Kamikaze, so this pronunciation become common for the Navy's Special Attack Corps (p. 90). 3. The Japanese Navy recognized Lieutenant Yukio Seki as the leader of the first official Kamikaze Special Attack Corps attack on October 25, 1944. However, another member of Sei Miyagawa's Yamato Squadron, Lieutenant Junior Grade Kofu Kuno, carried out a special attack on October 21, 1944, from which he did not return, so chronologically he carried out the first special attack from an officially recognized squadron of the Special Attack Corps that had been formed by Vice Admiral Takijirō Ōnishi in the Philippines. 4. Eidai Hayashi's 2009 book entitled Kuroshio no natsu: Saigo no shinyō tokkō (Kuroshio summer: Last shinyō special attack) explores in detail these issues regarding the accidental explosions that killed 111 men at the shinyō base in Yasu Town on August 16, 1945.